Over the weekend I have "mastered" the semolina flour pasta dough. It was challenging but outcome was beyond my expectation. I was surprised by the taste of pasta and ravioli, and that inspired me to work on my pasta making skills. 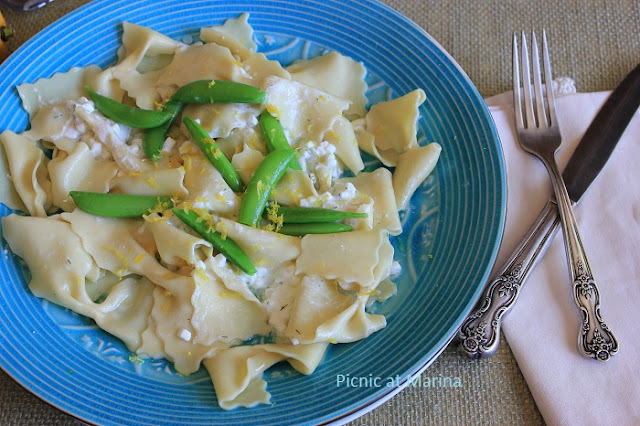 Pasta with a cottage cheese and a lemon zest. Simple and tasty. Next time I will tell you what obstacles I had to overcome and how I managed to do it. Quite fun experience if you ask me! What surprised you today? What inspired you? Is it an eggless dough?? No, it has eggs. My next project with pasta would be the eggles dough made with semolina flour and water. Thanks Inessa! I love it with feta cheese but I didn't have any in the fridge so just made with ricotta and some cottage cheese. Great! Loosing weight is a big deal (I know it first hand, I lost 35lb and need to shake about 10 more). So cool! That is something I always wanted to try! Try it and you'll love it! Everyone would! YOU surprised me with this fabulous looking pasta! How fun to try new things and come up with such wonderful results! 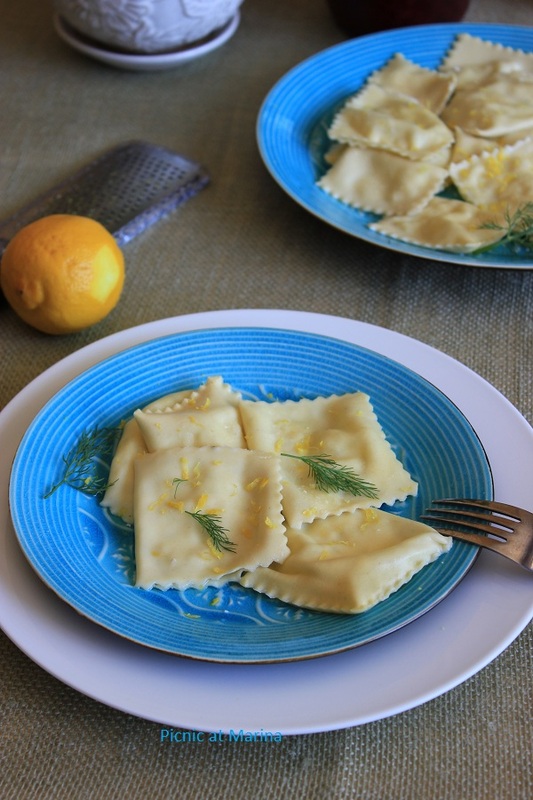 I love homemade ravioli, I even dedicated an entire blog post on how to make them, I can have them everyday, they are so comforting and remind me of childhood! Your ravioli and noodles are beautiful! I have thought about buying a bread maker and making bread, seems easy enough. But noodles, that looks difficult. Wow, this looks superb! Great job. I can't wait to hear about it! I just ordered a pasta maker - I can't wait to play around with it! They look great! Well done you! I have not made these in ages but I know how good homemade pasta tastes! Home made paste definitely tastier then store bought and did you notice how much quicker it cooked? Hi Norma, Yes it cooks in about 3 minutes when it's fresh. But when I let it dry it needs to be cooked for about 6-7 minutes. Either way, it is delicious! Hey Marina! Thanks so much for stopping by and commenting on my blog! I'd love to learn to make my own pasta dough some day! It sounds like a very challenging yet rewarding thing to do. I love all kinds of pasta so if I could learn to whip some up on my own, that'd be awesome! I'd love to see your recipe sometime! Btw, totally following you back now! Pasta is one thing I've never made- but I'd love to try. Your's looks delicious!